In October 1835 the former Catholic church was consecrated by the Right Reverend Cyril, the Archbishop for Podoliya and Braclaw as an Orthodox church, namely the Nativity Church. 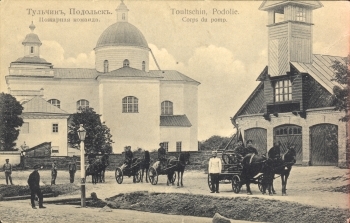 Initially, the Nativity Cathedral in Tul’chin as a project of a Catholic Dominican church with monastic cells was being sponsored by Count Stanislaw Potocki during 1786-1817. Yet it was in 1832 that Podoliya province got out of Polish control with the Cathedral being then delivered under the Orthodox authority. Following the Royal Command they closed "each and every Catholic monastery in excess and proving neither solid dwelling monks number nor adequate supplies to perform" at that time. One of the most serious reasons for the State to cease Dominican monasteries’ activities and to transform these into parochial Catholic- or even into Orthodox churches throughout Kamenets, Smotrich, Letichev, Vinnitsa, Bar, Tul’chin, Sokolets, Tyvrov etc. served that of their active participation under Catholic clergy’s clear leadership in numerous Polish mutinies within the Podoliya region. In October 1835 the former Catholic church was consecrated by the Right Reverend Cyril, the Archbishop for Podoliya and Braclaw as an Orthodox church, namely the Nativity Church. There was the inscription made on copper plate to verify this act, which plate has been kept since then inside the Church. Later on there was the altar sponsored by the Councillor of State's (Alexander Abaza) widow to be erected within the western chantry chapel and on the 20th day of August in the year of 1867 this was consecrated in honor of the Holy Trinity. As of the year of 1872, there were 928 parishioners of both sexes whom the Church cared of. 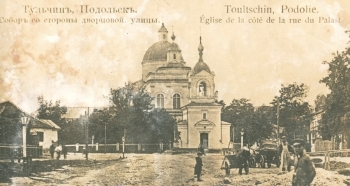 All two-storied buildings belonging to churches, as the decree by the diocesan authority demanded from October 1st, 1862, had to be delivered with a half of church’s landed property to accommodate the theological school transferred from the town of Krutyh. 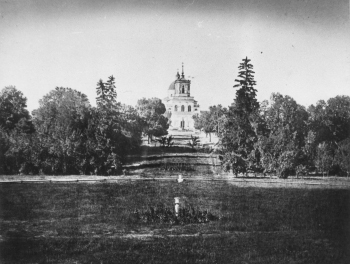 Picture of 1872, Courtesy by the Austrian Photographer. It was commanded in spring of1883 that the church at the school, residing in one of the back rooms inside the school, should be treated as the "one which does not meet the requirements due to its disposition and narrowness". Because of the above, there was the chantry chapel disposed inside the Nativity Church on November 30, 1883, this being consecrated to honor the Holy Spirit's Appearance, since the same consecration had been made to the school church earlier. The parochial school was organized here the same year. Devine service being carried out inside the great three-altar church until the year of 1928, when "to satisfy the working people's of Tul'chin wish" the church was closed as the public worshiping institution, and became a theatre. Under the German-Romanian occupation in Tul'chin (1941-1944) the building was transformed back into church, but on 8 September, 1945 the Nativity of Christ Church was again transformed into the municipal theatre and palace of culture by the Vinnitsa Executing Committee's Decree Nr. 1029, while all the church's property transferred to the Dormitory Church. Later, the Junior Sporting School took the possession of this place. Finally, in 1991, on the 15th day of April the holy church was delivered as the life-time domain back to citizens-parishioners of the Christ-Nativity Church by the Executing Committee of Tul’chin People’s Rayon Deputies Council. Based on the President’s of Ukraine Decree from March 4, 1992, there was the Command by the President’s of Ukraine Representative for Tul’chin Rayon on September 8, 1992, Nr.148 to return the remaining adjacent buildings and quarters belonging to the Church back. The Holy Synod by the Ukrainian Orthodox Church proclaimed the Tul’chinskaya Diocese on October 4, 1994; the Church becomes an Orthodox Cathedral thereafter. On July 20/3, 2004 the altar was consecrated to honor the Holy Blessed Prince Alexander Nevski. There was the altar consecrated inside the second chantry chapel on November 11/24, 2004 in honor of the Holy Martyr King Nikolai as well as to honor all Royal Martyrs and Russian Neo-Martyrs. Diocese Chronicles of Podoliya (1876), Historical Description of Podoliya (1891). Subdivisions and Churches within the Podoliya Diocese (1901), State Vinnitsa- and Khmelnitskyy Regional Statistics- and Data Bases, the National Ostrovski Library in Khmelnitskyy, the National Vernadskyy Library, special thanks to the Photo V.A.Vigurxhinskyy archive (Tul’chin).